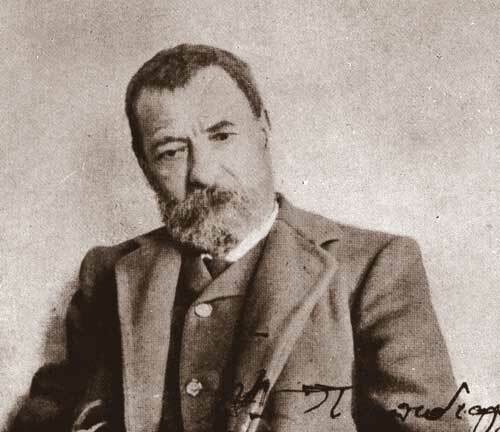 He was born in Skiathos island in 1851. His father was the minister Adamantios Emmanouil and his mother Aggeliki. He was brought up among nine brothers, two of which died young, with the fear of god and he got familiar with the religious atmosphere and practices at an early stage of his life. He created a christian-like character that he maintained grimly till the end. He started being educated in Skiathos in the boarding school of the Evangelism monastery. He went to highschool in Chalkida and Piraeus and he finished in Athens. As he was always poor he started tutoring students. In 1872 he visited Agio Oros along with his friend Nilolaos Danielos and stayed there for eight months as a noviciate. Not believing that he was worth becoming a monk he returned to Athens and enrolled at the Philosophical School of the university which he didn’t finish because of the poverty and his poor health. The fact that he didn ’t take his degree made his father very sad since he was waiting for him to return to the island as a professor in order to help his four sisters. Three of his sisters remained single and stood by him whenever he had problems. Because of his economic problem he had to return to Athens. As soon as he enrolled in the university he started writing and translating from French and English. His income was slender so he had to live in cheap rooms always undemanding. His position became better when he met the journalist Vlasis Gavriilidis who founded the newspaper called Acropolis and for the first time in his life he was highly paid. But nothing changed since he was not careful at all with his money. He was spending it wastefully, he was paying his bills, he was sending money in Skiathos, he was giving some to the poor and then he was poor again. He couldn’t buy a suit or a shirt that he needed so much. His tortured life, intensive work and especially drinking which became a habbit, smoking and staying up late at night led to daily tireness that ruined his health and led to his death before his time. During his whole life he was unapproachable, he liked isolation and didn’t have many friends. He lived trapped in his world where he asked for spiritual relief through his poems and his writings which revived the old legends of his island Skiathos. In 1908 he returned to his island where he continued the translations in order to gain some money but after some time his hands were swollen and he couldn’t right anymore. He died in January 1911 after his health has worsened. The people of the island were sad to lose him. All over Greece they were griefing, poems were written for his loss, songs and articles were written in magazines to his honor. He didn’t live to see any of his works published but after his death most of his writings were published by different publication houses. His works have also been translated in French.